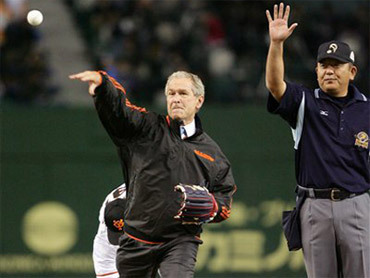 Former President George W. Bush threw out the ceremonial first pitch before Game 3 of the Japan Series between the Yomiuri Giants and Nippon Ham Fighters. Bush, wearing a Yomiuri warmup jacket, took the mound Tuesday at Tokyo Dome and threw a pitch to Giants catcher Shinnosuke Abe that bounced once in the dirt before being caught. Bush chatted briefly with several players after walking off the field and watched the game in a private box with former Japanese Prime Minister Junichiro Koizumi. Also in the box were Japanese home run king Sadaharu Oh and U.S. Ambassador John Roos. The Giants won the game 7-4 to take a 2-1 lead in the best-of-seven series, Japan's version of the World Series.